This is a wonderful collection of Curtis Mayfield rarities, that was released as a bootleg entitled 'Keep On Keepin' On'. I think the original version came into circulation on silver disc, not that long after Curtis passed away ( ten years, this coming December). Since 2003 it has appeared predominately on a limited number of Soul, R&B, and Funk enthusiasts web pages. However Curtis Mayfield had a message that went way beyond just musical style or genre. 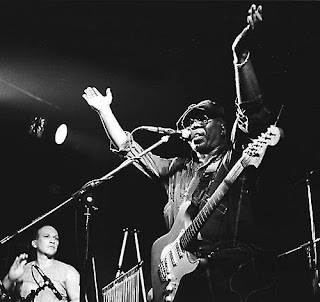 'Curtis Mayfield is remembered for his introduction of social consciousness into R&B and for pioneering the funk style in the 1970s. Many of his recordings with the Impressions became anthems of the Civil Rights Movement in the 1960s, and his most famous album, Super Fly, is regarded as an all-time great that influenced many and truly invented a new style of modern black music'.